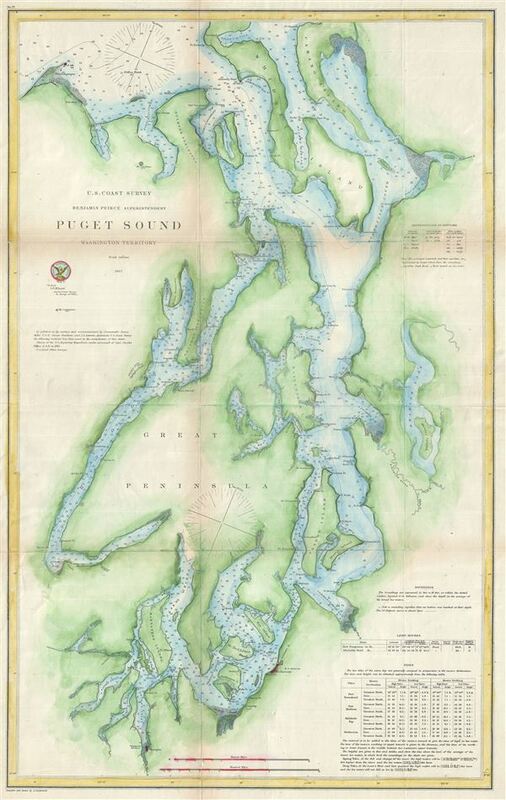 An uncommon nautical chart of Washington's Puget Sound. This is a very uncommon U.S. Coast Survey maritime map or nautical chart of the Puget Sound, Washington Territory, dating to 1867. It covers Puget Sound, named by George Vancouver after one of his officers Lieutenant Peter Puget, from Quimper Peninsula and Whidbey Island south as far as Olympia. The map identifies the various islands as well as safe channels and countless triangulation points throughout. Olympia, Nisqually, Steilacoom, and Seattle are named, though, aside from Olympia, most were undeveloped. Countless depth soundings appear throughout. Notes on soundings light houses, and tides appear in the lower right quadrant. Prepared under the supervision of Benjamin Pierce, Superintendent of the U.S. Coast Survey, for the 1867 Superintendent's Report to Congress. Report of the Superintendent of the United States Coast Survey, (Washington) 1867.